That was a close one. I saw the update for WordPress 3.01 staring me in the face. I decided to update this blog first using the automatic updater…and it failed. Something about unable to find the public_html folder or something. So I did a search and found out one had to delete the “upgrade” folder, create a new one, and chmod it to 777. OK, did that. Then tried the update again and it failed even worse. couldn’t copy some file wp-admin/css/theme-editor.dev.css. It even put an ugly maintenance page on my site as well. I hate it when technology screws around with me…sets my body into panic mode. So I then frantically searched for information on what to do. I figured out I should probably attempt a manual update. So I did that, followed the instructions, and fortunately it worked, thank goodness. You wouldn’t be reading this if it didn’t. When it comes to my WP installs, this site as well as Ann-S-Thesia, have problems with automatic updates and installations. Have to do a lot of manual installs. Dingbatcave doesn’t have problems like that. BTW, Dingbatcave and Ann-S-Thesia aren’t live yet with the revised part of the sites. I’m still working on that, and probably won’t have it done any time soon since August will not exactly be productive as far as web sites go. I fixed that silly Calendar in the left hand column. Funny how you can wrack your brain trying to figure out how to fix something and never solve the problem, and then while you’re working on something else you immediately see how to do it? I installed a version of WordPress on my Ann-S-Thesia site (I plan to run it on WP) and was just going through the routine settings configuring it, and there it was staring me in the face. You can set the calendar to start on any day you’d like…Thursday, even (although why you’d want to start the week on a Thursday is beyond me). The default is Monday. Don’t know why…all the standard calendars I’ve seen always begin with Sunday, and I think it’s confusing–at least to me–to have it start on Monday. Warning: Geek Talk Stuff – move along, nothing interesting to read (or comprehend) here. I fixed the link structure on this blog to have real words and dates rather than just a goofy meaningless number like ?=123. It’s silly that is the default for WordPress. Then it gave me a code to insert. I replaced the previously exisiting code in my .htaccess file with the code above (I already have an .htaccess file in the folder above my WP folder). And now it works! Yippee! I was afraid I would have to use “ugly” links for the rest of my life. I’m so glad I found the solution and was able to *competently* solve the problem instead of having something blow up and become completely unusable…as it so often used to do. I’m very relieved. One of the few times technology just made me temporarily frustrated rather than making me cry. 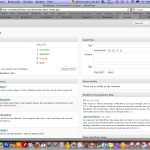 I’m very much a beginner with WordPress. 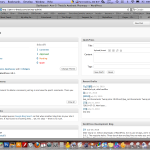 Back in the early days during the first exodus away from Blogger (nearly 10 years ago), I used Greymatter. Talk about slashing wrists…next time I have to install a php script, this non-geek ann-alog girl is hiring someone. I heard of WordPress, but thought it was something you had to PAY to use. I guess maybe that’s true if you host it at their site, but I didn’t realize I could install WP on my own site via Fantastico in my CPanel (I just totally confused Stan…he’s less geeky than I am). Anyway the installation was quick and easy and didn’t leave me confused as did Zen-Cart (I worked out a trade with someone who’s hired me in the past to do graphics, so she installed it for me after my feeble Fantastico installs with it…wasted 2 of my MSQL or whatever they’re called…things…see, I can’t even get the language right, but I digress). Anyway, WP gives you these avatars. I’m not really sure I understand it all, but if you take a look at the comments in my last posting, and control-click on the avatars for Stan or me, bring up a new tab or window, you’ll see that they’re not hosted on ornamentalillness.com. They’re hosted at gravatar.com. Now see that long string of numbers in the /avatar/ directory? see the last end: =48&d=monsterid&r=PG. Change that =48 to =80 so you can see a larger image. Heck, turn it up to 11…111. Whatever size you’re comfortable with. Now take that long string of alphanumeric characters…play around with that…change the numbers and letters. The avatar image changes. There literally must be (Sagan voice) billions and billions of these “generated” images! How infreakin’ credibly cool is that? How do they do that? I wish I knew how to do something like that, customize it to this site. I’ve been using the “Monster ID”…I think I’ll try a “Wavatar” just to see what it does. I can always switch back. Not really big on the “Identicon” because it’s just too ubiquitous…I see those on too many other WP sites.